It's a funny thing, that a country renowned for its meaty diet should make the best tofu. 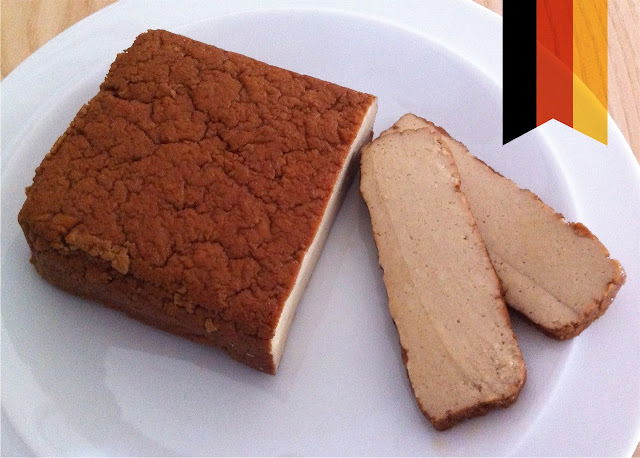 German smoked tofu is a league above anything else, being moist, tasty and with a great texture too. Perhaps it's no surprise that with centuries of experience with flesh, they should excel at applying their skills to plant foods. You can buy German tofu in the UK, under the Taifun brand sold in wholefood stores. You'll find it stocked next to lesser offerings from UK producers. Where the German tofu is tasty though, the local tofu is coarse, and with more of a rubbery texture than the smooth cutting German stuff. UK producers often cut corners too, using liquid smoke, rather than smoking the tofu blocks in the traditional way. The liquid smoke tends to make the tofu a little bitter, rather than impart that meaty deliciousness that is so desirable.